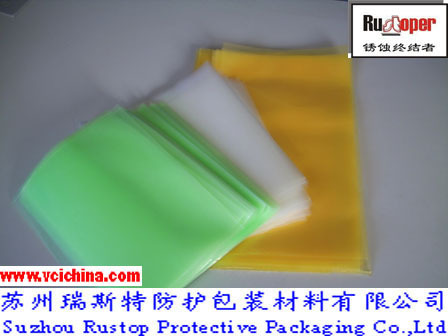 Rustoper (corrosion terminator) VCI Bag is made by processing high-quality VCI films as basic materials. VCI plastic film is the new generation of creative hi-tech products based on the combination of the high polymer material and VCI antirust technology. After the film is used to pack and seal the articles for antirust, VCI contained in the film begins to sublimate and volatilize the antirust gas factors which diffuse and penetrate into the surfaces of the articles for antirust and adhere on them to form a compact protection film with the thickness of monomolecular to avoid the surfaces of the articles for antirust in contact with all factors inducing corrosion, thus the corrosion is effectively prevented. 1 The film performs excellent gas phase and contact antirust function, with good antirust effects and high cost performance. 2 The film is clean, harmless and non-toxic, so it is safe to environment. It passes SGS certification and meets RoHS directives. 3 The articles for antirust may be used immediately with no need to be degreased and cleaned. Therefore, the film can save labor and time, improve work efficiency and save cost. 4 The film is transparent and aesthetic, so the articles for antirust are visible dynamically and easy to be identified. 5 The film is extensively applicable, and may be used for either single part or entire equipment. 6 The film is good in printability, which is helpful to improving the image and the grade of the articles for antirust. The VCI film is applicable to ferrous metal, alloy steel, cast iron, copper, brass, bronze, plated metal, zinc and its alloy, chrome and its alloy, cadmium and its alloy, nickel and its alloy, tin and its alloy, aluminum and its alloy, and other metal materials and their products. 1 Clean and dry the surfaces of the articles for antirust before packing. Then pack and seal them at normal temperature and room temperature. In case of packaging with oil contained, it shall be confirmed there are no chemical components such as S and Cl. contained in oils. Otherwise the chemical components will have negative effects on VCI function. 2 Operate with clean gloves before packing, and do not contact the articles for antirust with naked hands. 3 In case the articles for antirust have projections and edge angles, be careful not to pierce the film during packing. In case of its unintended breakage, it shall be pasted and sealed with a industrial tape in time to ensure its seal.